Home › SFX 2018 › Horned King › Fail Fast. Recover Faster. Practical and visual effects become seamless on film through hard work and skill, amazing design, and one’s ability to recover quickly from a total disaster. Unfortunately for us, bringing the Horned King to life is definitely living up to the “Fail Fast” mentality as we strive to conquer disaster after disaster in our journey to fear. Introduced to us in our first class meeting, “Fail Fast” is the mindset that once an idea absolutely fails, one shouldn’t dwell in the defeat, but take a breath to understand the problem and take another breath to find the solution. For us, this mentality has come into play on more than one occasion allowing for a wide range of experimentation, collaboration, and learning. In order to recreate the skeletal aspects of the Horned King onto our actress, we have been casting silicone pieces of the key facial features to enhance a strong brow, high cheek bones, and a bony jaw. Using Ecoflex 00-35 Fast silicone from Smooth On to cast reusable molds and Dragon Skin FX-Pro silicone rubber to cast the final pieces for our actress to wear, we have not only learned how to cast and mold in silicone, but also how to royally screw up casting and molding in silicone. When casting our large forehead piece with protruding horns that required a much higher clay wall than our previous casts of the two jaw pieces and cheekbones, we discovered that when you believe you have mixed a lot of silicone, you have actually barely filled the surface. In fact, we never even reached the tip of the horns after two separate pours of equally large amounts of silicone. Our Dragon Skin forehead. Notice the torn and smashed look of the horn points. 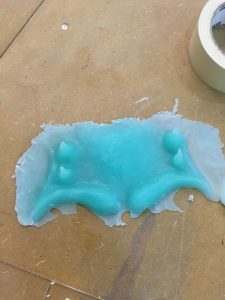 How We Are Going to Fail Fast: By using Skin Tite silicone adhesive as an on-the-spot sculpting silicone, we will create the ending points of the horns. 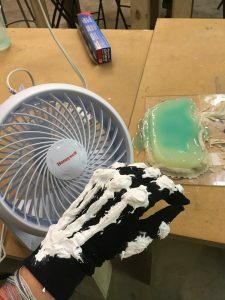 After all the success we had with creating our rotting flesh appearance through masking tape, paper, and paint, our go to easy fabrication was going to be running gloves covered in tape that would then be textured and painted. After the failed attempts to stick the usually sticky tape to the smooth fabric, it was decided that there needed to be a better and quicker solution. 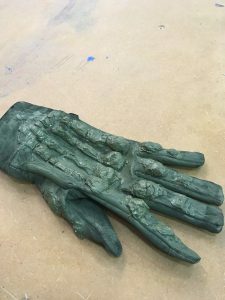 The base coat of rotting green paint after the modeling paste had dried. My modeling paste experiment drying. So far, it has been the best quick recovery! What We Did Wrong: Attempted the impossible of sticking masking tape to running gloves. How We Have Failed Fast: Textured the gloves with modeling paste and paint directly on the fabric. 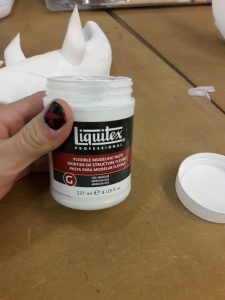 Modeling Paste acrylic medium used for both texturing our horns and gloves. In all our research and concept art, we had come to the conclusion that we would need to have a skeletal nose as one of our silicone attachments in order to fully get that “dead look.” So how does one get rid of a human nose without bodily harm? We looked to the big franchises for this answer and found our solution on the nose-less face of Red Skull from Marvel’s Captain American: The First Avenger. 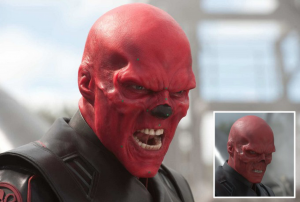 Before and After the Red Skull Post Production Nose Job for Marvel’s Captain America: The First Avenger. 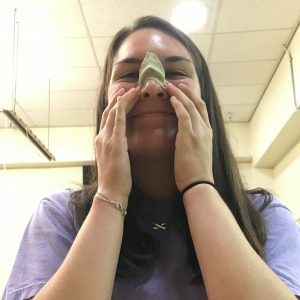 Sarah modeling our new nose bridge. What We Did Wrong: Ignored the easy VFX solution, but also avoided the inevitable sculpting and casting doom of a full nose piece till it was too late. How We Are Going to Fail Fast: By sculpting and casting a silicone nose bridge, then using black makeup to cover the nose to be later masked out in post production VFX work. So far this project has been a wild ride full of its many stressful ups and downs, but luckily we are a team that doesn’t break easily and are always up to finding the next best fix!